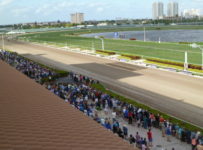 Gulfstream Park on Wednesday said it has received 139 nominations for the nine stakes races that will be run July 2 on its $1.125 million Summit of Speed card. The day will be highlighted by the $250,000 Princess Rooney (Grade 2) and the $250,000 Smile Sprint (Grade 2), a pair of Breeders’ Cup ‘Win & You’re In’ events. The Princess Rooney and Smile Sprint winners will earn fees-paid berths in the Breeders’ Cup Filly & Mare Sprint (Grade 1) and the Breeders’ Cup Sprint (Grade 1), respectively, at Santa Anita Park in Arcadia, Calif. On Nov. 5. Forum Racing’s Birdatthewire and Harold Queen’s Sheer Drama top a list of 20 fillies and mares nominated for the Princess Rooney, at seven furlongs on dirt for fillies and mares 3-years-old and up. The Dale Romans-trained Birdatthewire, won the 2015 Gulfstream Park Oaks (Grade 2) and later won the LaBrea Stakes (Grade 1) at Santa Anita on Dec. 26. (NOTE: Photo on home page is Birdatthewire winning the Gulfstream Park Oaks). The David Fawkes-trained Sheer Drama, a multiple Grade 1 winner last year, captured the seven-furlong Madison (Grade 1) at Keeneland in Lexington, Ky., this past April. Grade 1 stakes-placed Kiss to Remember, who finished third in the 2015 Princess Rooney, and Grade 3 winner Best Behavior were nominated by Miller Racing and trainer Marty Wolfson. For the Princess Rooney, Wolfson also nominated WinStar Farm’s Cali Star, who captured the Rampart (Grade 3) at Gulfstream last December. Glenmare Farm’s I’m a Looker and Seajay Racing’s Spelling Again, who finished first and third, respectively, in the Winning Colors (Grade 3) at Churchill Downs on June 11, also were nominated to the Princess Rooney. Good Friends Stable’s Private Zone, a multiple Grade 1 winner, is most prominent on the list of 17 nominations for the Smile at six furlongs on dirt for 3-year-olds and up. Katherine Ball’s Limousine Liberal, runner-up to Runhappy in the King’s Bishop (Grade 1) at Saratoga last summer, lost a photo finish in a second-place finish in the Aristides (Grade 3) at Churchill Downs last time out. Jacks or Better Farm’s Awesome Banner, who captured the Swale (Grade 2) at Gulfstream 2015-2016 Championship Meet, was nominated to the Smile, as well as the $150,000 Carry Back (Grade 3), a seven-furlong sprint for 3-year-olds on the Summit of Speed card. The Mark Casse-trained 3-year-old son of Awesome of Course returned to sprinting with a 2 ¾-length triumph in the Big Cypress at Gulfstream last time out after unsuccessfully stretching out in the Fountain of Youth (Grade 2) and Tampa Bay Derby (Grade 2). Gelfenstein Farm’s Dearest tops a list of 3-year-old fillies nominated to the $100,000 Azalea, at seven furlongs on dirt. 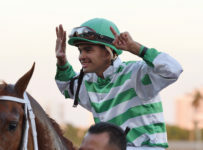 Dearest captured the Royal Palms Stakes at Gulfstream on June 4 by six lengths in her return from a third-place finish in the one-mile Davona Dale (Grade 2) at Gulfstream on Feb. 27. The Gilberto Zerpa-trained daughter of Midshipman, who was also nominated for the Princess Rooney, has won three of four starts.